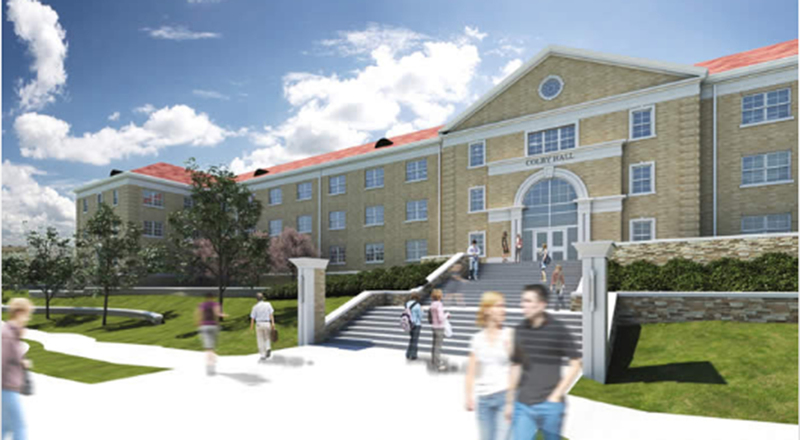 Continuing its focus on providing world-class student housing, Texas Christian University is renovating Colby Hall, an all-female dormitory. While the exterior of the building will largely remain the same, a new, grander entrance includes a front centered stairway and a surrounding short, landscaped wall. The interior of the building has been completely gutted and redesigned. Built by Beck, the renovated Colby Hall will provide approximately 350 beds, with a mixture of double and suite style rooms, including super suits. Other updates include a study lounge, common rooms on each floor and centralized stairs. As well, students will enjoy a new theater in the basement and printing station on the first floor. While each floor only features two restrooms, the restroom blocks are larger and include more showers and toilets. Colby Hall is scheduled to house students beginning in the fall 2015 semester.